within easy reach of Dundee and Perth in rural Angus countryside. The fertile Vale of Strathmore divides the Grampian Mountains from the Sidlaw Hills North of Dundee. 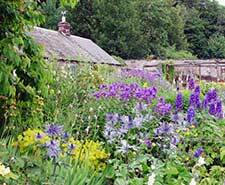 Here, between Blairgowrie and Kirriemuir, is Yvonne Mallet's row of delightful cottages, Victorian workers houses joined together in a line overlooking an old walled garden. The two cottages on the left in the photograph are traditional farm cottages, now delightful ,comfortable self catering holiday rental cottages, each sleeping 2. They sit amid a sensational walled cottage garden, created by the owner, Yvonne Mallet, who is a noted garden designer. Strathmore is most famous for its black Aberdeen Angus cattle, delicious raspberries, and Glamis Castle, ancestral home of the Queen Mother (open to the public). There are over 50 golf courses within as many miles, fishing, touring and walking - one of the loveliest Angus glens, Glen Clova, is only a few miles away. Dundee and Perth are about half an hour by car. The walled garden is secure for children to play in and there is a barbeque and garden furniture. 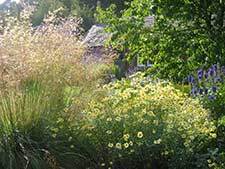 Guests at the cottages are very welcome to use the selection of herbs growing along with any surplus garden produce. All in all this a very is relaxed and friendly place to stay. Bathroom and Double or Twin bedroom (with zip-link bed). two views of the Sitting Room and Dining area. Kitchen with washer/dryer, microwave, cooker, etc. 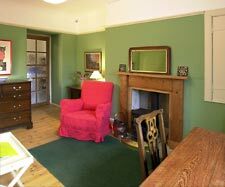 The cottage has electric storage heaters, cot (crib), high chair, colour television, VCR, and there is a multi-fuel stove in the Sitting Room. Double or Twin bedroom (with zip-link bed). This cottage also has a dining room (not shown). Summary of facilities for each cottage. Sleeps two with double or twin bedroom. Sitting room with comfy sofa and armchair. Kitchen with electric hob and oven, microwave, fridge and washer/dryer. Heating by electric storage heaters (white meter) and wood burning stove. Bed linen, towels and initial supply of fuel for stove included in the rent. Colour TV, Freeview, video, radio, hairdryer, use of mobile phone, barbecue. Shared walled garden with garden furniture for each cottage. Baby and dog sitting services available. Awarded Silver for Green Tourism. Please note, weeks run from Saturday to Saturday. 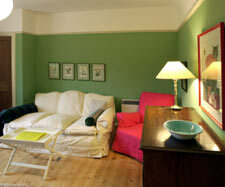 Short breaks (minimum 3 nights) sometimes available. A deposit of 25% secures your booking, with the balance to be paid 4 weeks from the start of your holiday. On your arrival a pack of fuel is included (for the Stove in the Sitting room). Electricity is measured by meter reading and is payable at the end of your stay. No smoking inside the cottages please. Garden photographs courtesy of Yvonne. Please tell Yvonne you found Littleton of Airlie Farm Cottages through About Scotland!